A few months ago a friend that lives in the area near this restaurant said that she ordered from here a lot - and after looking at the menu I could understand why! Their menu is sort of like Cheesecake Factory's - 10+ pages and a lot of variety. Just last week an old friend from a prior job and I met up for our occasional dinner out and agreed we had to try this place in Chinatown! I will admit there is certainly nothing on the outside that would draw you into this place, on the second floor of a rather rundown building on a side street in Chinatown. The food is definitely worth checking out though - it's vegetarian, but they have lots of vegan options as well. 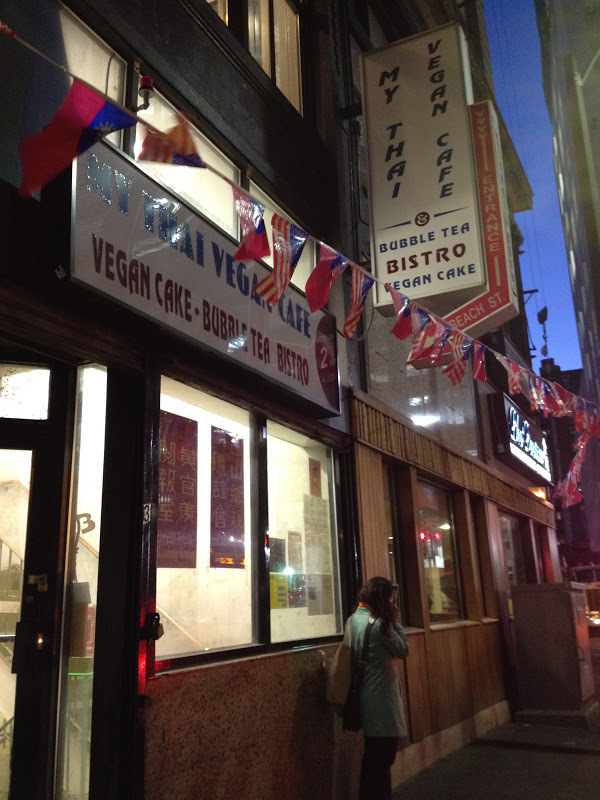 Actually, I'm not sure why it isn't called 'My Thai Vegetarian Cafe.' Plus, even better, you cannot beat the prices here! For two soups and two main dishes our bill came to $24! I should also point out that this was with my of my vegetarian friends, so the prospect of having an entire menu to pick from must have been amazing! After dealing with how overwhelmed we were, given just how many dishes sounded amazing, we ultimately settled on sharing two main dishes and each of us tried their Wonton Soup to start. You'll find categories like: salads, soups, chef specialties, light entrees, thai fried rices, stir-fried noodles, tofu specials, thai curry specialities, vermicelli, and then categories around their different 'proteins' - veggie beef, veggie pork, veggie duck, veggie chicken, veggie seafood. 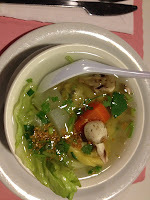 Wonton Soup - a mixed vegetable soup with chinese-style wontons filled with ground veggie-chicken, tofu, mushrooms and onions. 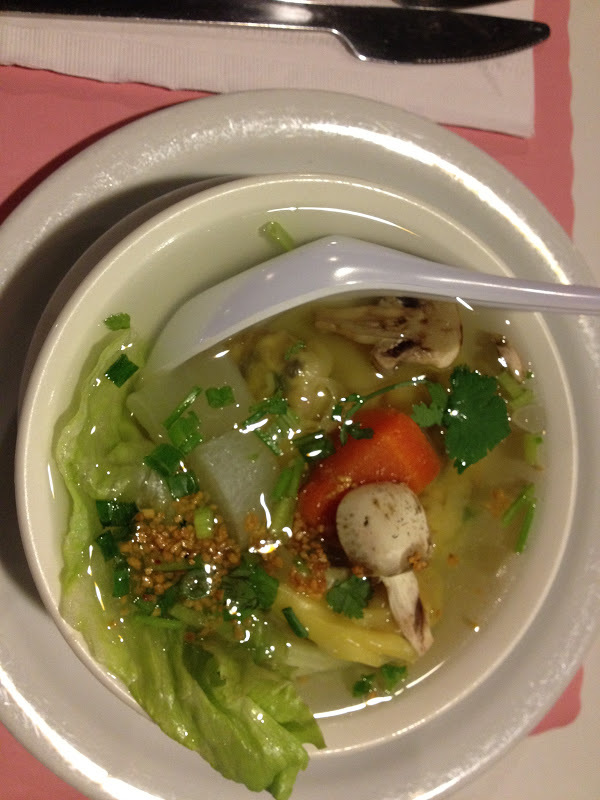 I didn't love the wonton filling in these, but the soup broth itself was delicious and it was full of vegetables! Cashew Nut Chicken - sliced 'veggie-chicken' sauteed with roasted cashew nuts, onions, mushrooms, red bell peppers, snow peas, scallions and celery. Loved all those veggies! 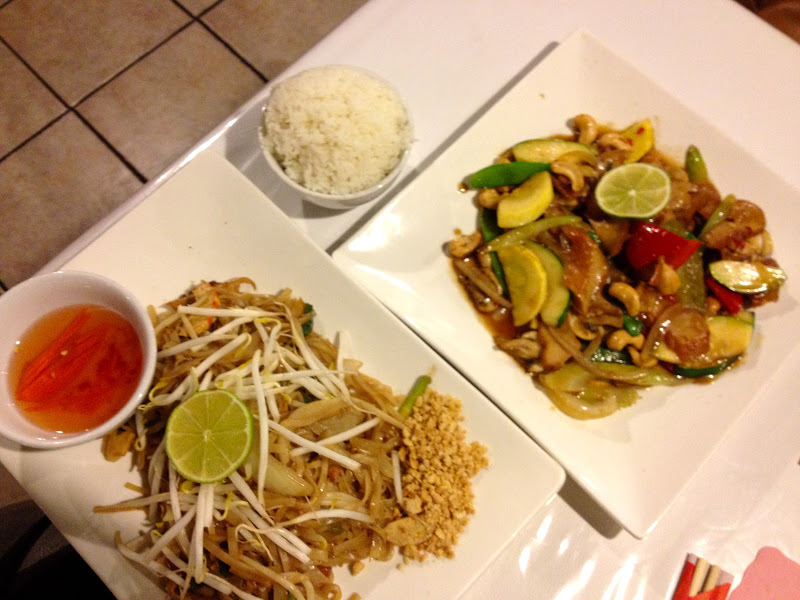 Pad Thai - their signature thai dish, pan-fried noodles with veggie-chicken, veggie-shrimp, onions, scallions and bean sprouts in a sweet and sour sauce, topped with fresh bean sprouts and ground peantus and served with sliced lime. They don't seem to have their own website, but Boston Menupages does a good job giving you information about the restaurant. I was a little nervous about all of these 'veggie' proteins but in the end I was pleasantly surprised with how much flavor all of the dishes had. If I hadn't known, I don't think I could have told you that it wasn't chicken given its similar texture and look, so be adventurous when you come here and don't just get the tofu and veggies dishes! A birthday party a couple weekends ago brought me to Top Chef contestant, Tiffani Faison's new restaurant in the Fenway area - Sweet Cheeks. I was a bit skeptical, given I'm not usually a fan of heavy bbq food but I had a great time and the food was surprisingly delicious! Basically you can come here once a year though - the food is unbelievably rich and heavy. They have great big picnic tables for large groups and I'm always a fan of the glass jars for cups. Having browsed the menu in advance, I arrived still not sure of what to order. In an attempt to make even one healthy decision while here I opted for the simple roasted half chicken as my main and picked their salad as one of my sides. After numerous recommendations though I had to splurge for their mac and cheese and couldn't possibly resist their biscuits they brought to the table with a honey butter. Unbelievable. I couldn't even eat one whole biscuit - that's how big and rich they were! Everything is served on a tray - very rustic. which I, of course, avoided. For the birthday boy they brought out one of their giant nutter butters and what seemed like a hot s'mores cupcake with melted chocolate inside. I was a big fan of the nutter butter cookie - but yet again, anything with peanut butter gets my vote! I'm also not sure how any group fewer than 10 could eat that gigantic cookie! For a bigger group, be sure to make a reservation because the place isn't too big and it gets really packed. Oh yeah - and I almost forgot, their mixed drinks are creative - and strong! I tried their hard cider, which I also enjoyed. After a friend of mine made this at a 4th of July party this summer, I vowed to make it myself. It was so good and it also felt a little healthy. It's sort of like a salsa, and using tortilla chips is probably best for scooping out all of the delicious dip! Don't be scared off by the lentils if you don't know if you like them - they don't have a strong flavor and just take on the flavors of the other ingredients in this dip! Making the salsa is as easy as chopping all of your ingredients and mixing together! I recently tried out a new type of tortilla chips that I came across in the organic/natural aisle. 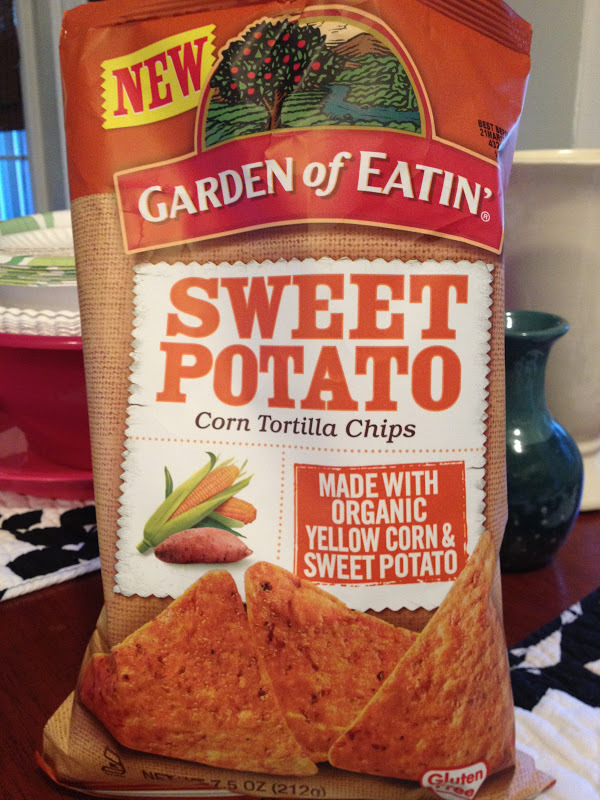 Anything made with sweet potato grabs my attention so seeing a corn and sweet potato tortilla chip was a must-try for me. As you might imagine, they were a tiny bit sweet and not quite as salty as the usual tortilla chips but they had lots of flavor, and the same shape and crunch as your usual tortilla chips. These were yummy on their own, but also worked fine with salsa. Don't let the natural sweet potato fool you though, they're still high in calories and fat grams. I attempted to order these on a menu in Chicago and when they came back to tell me they were out, I was disappointed. But alas, why be upset when I can recreate them myself?! Half the recipes I found online were shortcut recipes, as I like to call them - used bisquik or some sort of pre-made mix, sweet potato butter instead of actual sweet potato. *I'll give you fair warning, this recipe makes a lot of pancakes. I may be eating sweet potato pancakes all week for breakfast actually. It would be a difficult recipe to cut in half though because you use just one potato. 1. 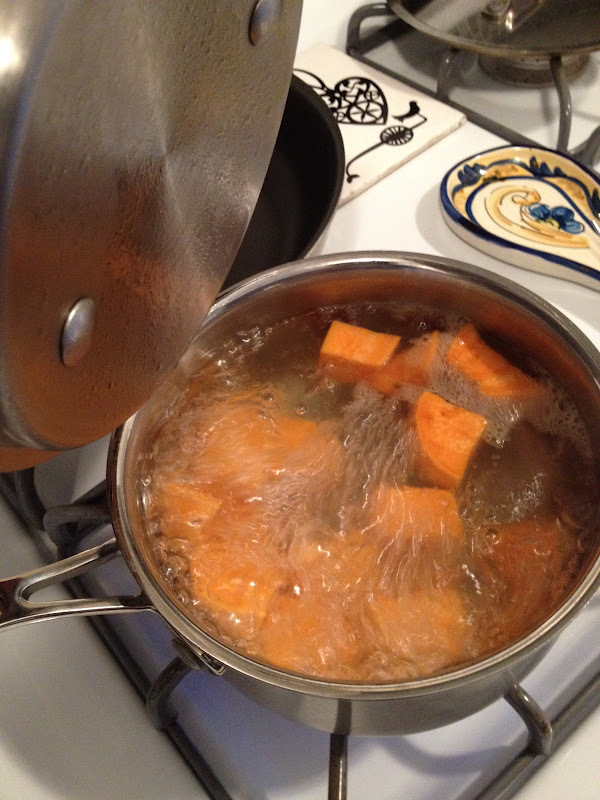 Peel, cube and boil the sweet potatoes until fork tender. Drain and let sit until the food processor is ready. 2. In large mixing bowl, add your dry ingredients. 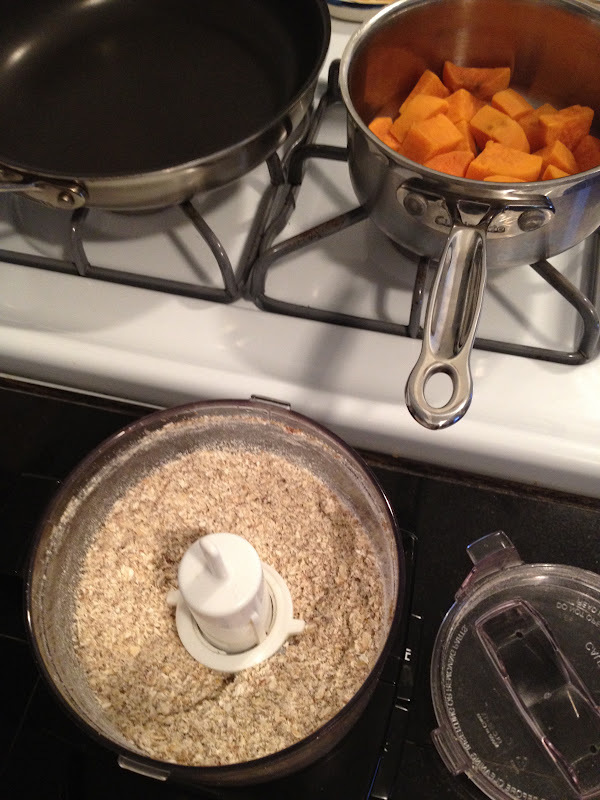 Before adding your oatmeal, take out your food processor and grind up the oatmeal and the flaxseed together. Add that to the other dry ingredients - the flour, baking powder, brown sugar, cinnamon and nutmeg. Whisk together. 3. 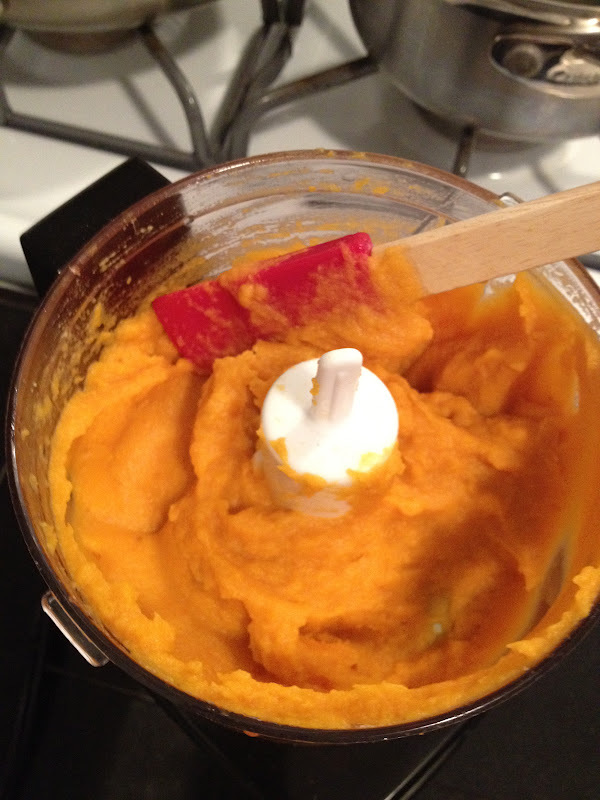 Back in the food processor, puree the boiled sweet potato together with the melted butter. The addition of the butter will help it to get the sort of silky smooth texture we're looking for! 4. In a small mixing bowl, beat your eggs together. Then add the sweet potato mixture to it and mix together with a fork. 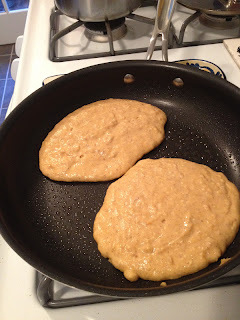 It will still be a pretty thick liquid at this point - with the back of your fork press out any un-pureed sweet potato chunks so there aren't chunks in the pancakes. 5. Then add your milk - mix well so that all of the ingredients are completely incorporated together. 6. 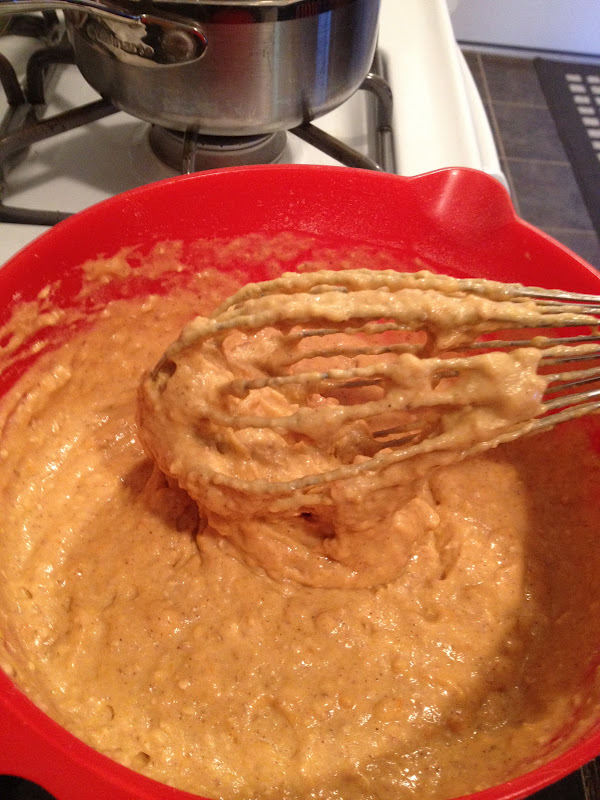 Add the liquids to the dry ingredients bowl and whisk together just until all of the dry ingredients are all wet. At this point you can decide if you need more milk, based on whether you like big fluffier pancakes or lighter, thinner pancakes. Personally, I like the thick ones, so I added maybe a couple TB more of milk just to be safe, but you could add up to another 1/2 cup of milk for the thinner pancake versions. 7. In a large, nonstick pan, heat over medium and once hot spray with nonstick spray and start making your pancakes! You can make them however large or small you'd like - just when the top starts to bubble, that's when you know it's time to flip them over. Well, correction - that's how you usually know when to flip pancakes over. With these, if you have them thick, they're so thick that you don't really see the bubbles. After 4-5 minutes I'd say you're safe to flip over. These turned out to not be very sweet, so the syrup was a nice addition on top. They were seriously the most fluffy, soft pancakes I've ever had - just totally delicious. Hint for those with lots of leftovers: Don't try to save the batter. I tried and they lost a lot of their fluffiness and ended up heavy and rather dense, not how good pancakes should be! Instead, make them all and put your extras in the freezer, then pop them in the toaster when you want to eat them!